Tagua (tah-gwah) is a plant alternative to ivory. A large, hard nut that can be cut, shaped and sculpted into. 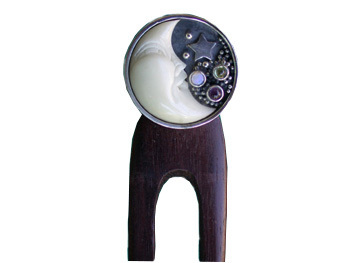 Get this elegant Tagua half moon face on an ebony wood hair pick with sterling silver. There is an amethyst, opal, peridot cabs and a sterling silver star design. It is designed by Sabine Koehring and made in Indonesia.